Finding the Games you Need! 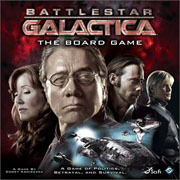 Battlestar Galactica is one of my favorite TV shows so it would stand to reason I would be interested in this game. But is the game any good? We're going to find out soon enough as Matt will be reviewing this game shortly, but I'll tell you what I think about it first: It does a great job of creating the feel of the show, particularly the first few episodes. You have probably heard about Dominion. It's probably the biggest game of the year. I had a chance to first play this over Christmas, and since then, I've played it quite a bit with both my family and my friends. It comes in a board game box, but it doesn't have a board, it's all cards. And it's simple. REALLY simple. And yet... it's so darn fun and has so many little variations to it that the game is never the same twice. I'm tempted to just offer a 100% guarantee on this game. I think if you are a gamer, you will enjoy this game, period. Pandemic, along with Agricola and Power Grid are the new big games on the block this season. I played once, and my entire team got wiped out very quickly. This is a cooperative game where everyone wins or everyone dies. In my case, we all died, which is kind of cool. There is a new expansion for this game coming in July. The second of the big three this season, along with Pandemic and Power Grid, I haven't played this game yet, but if you check out the reviews you'll see that it is getting great feedback. The third of the big three this season, along with Pandemic and Agricola, this is another game I haven't tried yet, but is getting great reviews and feedback, and is selling very well for us. A friend of mine played in a huge tournament in Salt Lake City and won the whole thing. Years later this game STILL sells well. I just donated a few copies over to Afghanistan to the soldiers fighting there. They love the game and play it continually. If you haven't played Settlers yet, then there is still time to get a copy and enjoy the game. There are a number of exciting expansions for the game as well. This game is one of the biggest selling games of ALL TIME. It is highly recommended across the board. Get your copy today!